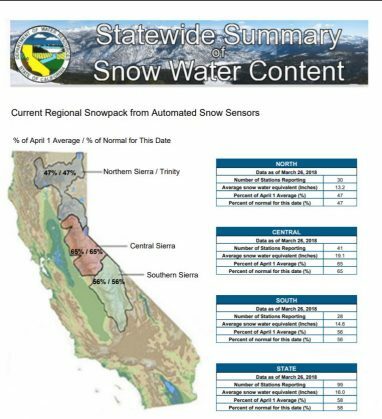 Snow Pack Gets A Huge Boost - Is It Enough? Ordinarily, 58% is nothing to write home about, as we depend on that snow to fill our reservoirs and provide drinking water. What’s different, and encouraging, is that fact that the storms also brought rain, and lots of it. Helping to fill our reservoirs to record levels. Folsom Lake, for example, is usually just over half full this time of year, peaking around the beginning of June at about 80% of capacity. Today, it stands at 85% of capacity, and with the new spillway completed, Folsom Dam operators are able to hold more water than in the past without risk of flooding. “Even if the snow pack never gets to ‘normal,’ and it probably will not, things are not in that bad of shape for the coming season,” AccuWeather Senior Meteorologist Ken Clark said. So, it looks like we won’t be having any water shortages this year, but as always, it’s a good idea to conserve. it will have to be. let's hope next year is at least as good.